Appellation or Vine Nebbiolo d'Alba D.O.C. 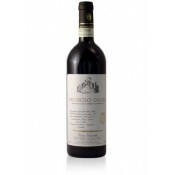 It is produced with grapes from a single vineyard facing South and planted within the Sorì del Ricchino, Diano d'Alba (CN), in the heart of the Langhe at 350 m above sea level. The deepest layers of the soil are formed by the S. Agata marls, while the superficial layers are calcareous-clayey and alkaline pH. The type of growth is Guyot. Most of the work in the vineyard is done by hand with the maximum respect for the environment using integrated type of farming. The harvest is done strictly by hand and the bunches are collected in small crates of 20 Kg in order to preserve their integrity, until they are crushed in the cellar. The yield per hectare is about 40 hl. The fermentation takes place in stainless steel tanks at controlled temperature with a maceration of more than 14 days. It matures in traditional large Slavonian and French oak barrels (25 hl) and French oak tonneau (500 lt) 100% second-passage for over 12 months in order to harmonize the great structure. Upon a 4-month passage in stainless steel tanks, it is bottled without filtration and rests 4 months before being released on the market. Bright ruby-red with garnet reflections. Intense nose with aromas reminiscent of marinated cherries and raspberries, and spicy hints of vanilla and dark chocolate in the background. In the mouth, it is elegant, harmonious with good freshness, velvety tannins and a long finish. Perfect reflection of the variety of origin, it shares bouquet and elegance with the Barolo with a lightness that goes well with any meal. 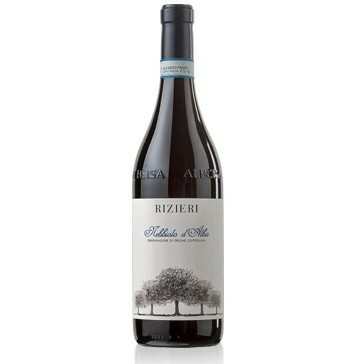 The Rizieri winery was born from a choice of change of Arturo and Barbara Verrotti di Pianella, a common project of life, a deep respect for nature and what it produces. Rizieri is located among the beautiful hills of Diano d'Alba, in the heart of the Langhe, in an area always been considered among the most suited to viticulture, the Sörì del Ricchino. The estate extends over an area of 13 hectares, combined in a single body, 6,5 of which are vineyards and the rest deciduous and mixed woods. The cultivated varieties, implanted between 1966 and 2006 with a density of approximately 5,000 vines per hectare, are the finest native species: Dolcetto, Barbera, Nebbiolo and Arneis. Lying on a hillside calcareous and clayey soil, facing South and surrounded by woods, they enjoy a unique microclimate, which, with its cool and temperate influences, allow optimal maturation of the grapes. The vines are treated with the maximum respect for the environment and the work in the winery is followed with patience and perseverance in order to achieve unique wines, that reflect the intense character and the elegance of their terroir and, at the same time, evoke the passion and the continuous pursuit of quality that animate those who produce them. The heart of the winery is the 19th century farmhouse, today partly dedicated to hospitality, which years of restoration have returned to the old charm. Perfect combination with roasted or stewed meats. It is the noble compendium for the hand-made tajarin with white truffle of Alba. Excellent with aged cheeses. It should be served at about 18°C (64°F) in crystal, transparent, smooth and colorless glasses. A long-lived wine that can be stored for 7-10 years. We recommend keeping the bottle in horizontal position, in the dark at a constant temperature. Good delivery service and so far good wine!